Salvatore is a sans serif typeface created by Diego Aravena Silo and published by W Foundry which is available in 36 styles, 2 widths (Normal & Roman) each with 9 weights (from Thin to UltraBlack) and italics. First width has neutral features however the second width comes with more versatile characters. Also it has a lot of usefull OpenTyepe features and languages support. This versatile font is suitable for branding, display, headline, logo magazine etc. It is the neo-grotesque version of Nutmeg font. 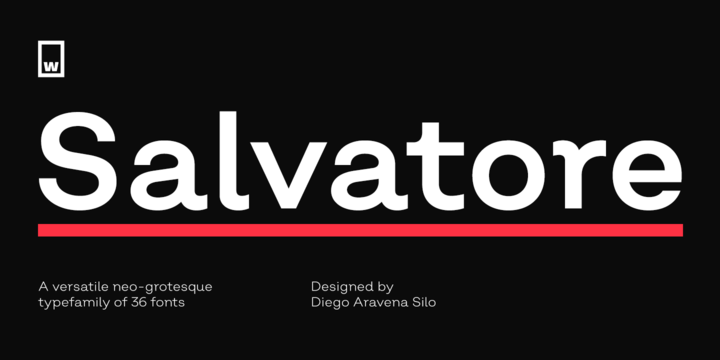 You will be saved by Salvadore font! A font description published on Tuesday, May 22nd, 2018 in Diego Aravena Silo, Fonts, W Foundry by Alexandra that has 1,893 views.